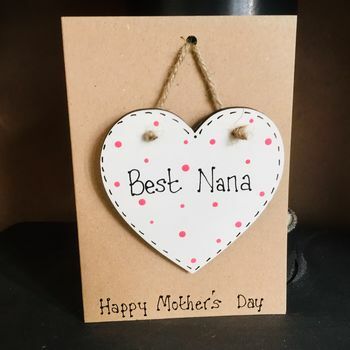 Here we have a quirky and unusual gift & card for any Mum, Nanny or Grandmother - personalised with your chosen spelling for that special lady. The heart is wooden and strung on quality jute can be detatched after and used as a lovely keepsake for hanging. Premier Medite MDF for the heart, jute string and high quality buff card.